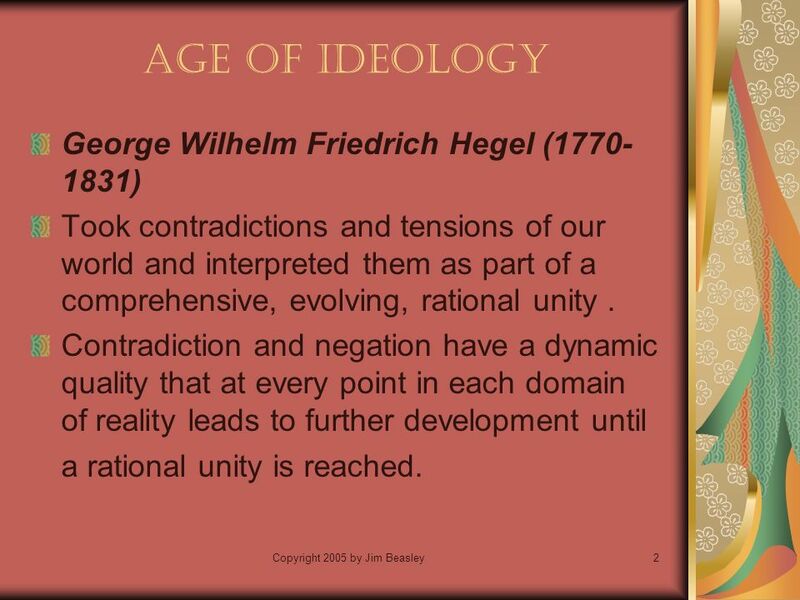 2 Copyright 2005 by Jim Beasley2 Age of Ideology George Wilhelm Friedrich Hegel (1770- 1831) Took contradictions and tensions of our world and interpreted them as part of a comprehensive, evolving, rational unity. Contradiction and negation have a dynamic quality that at every point in each domain of reality leads to further development until a rational unity is reached. 3 Copyright 2005 by Jim Beasley3 Age of Ideology George Wilhelm Friedrich Hegel The mind externalizes itself in various forms and objects that stand outside of it or opposed to it, and that, through recognizing itself in them, is "with itself" in these external manifestations, so that they are at one and the same time mind and other- than-mind. 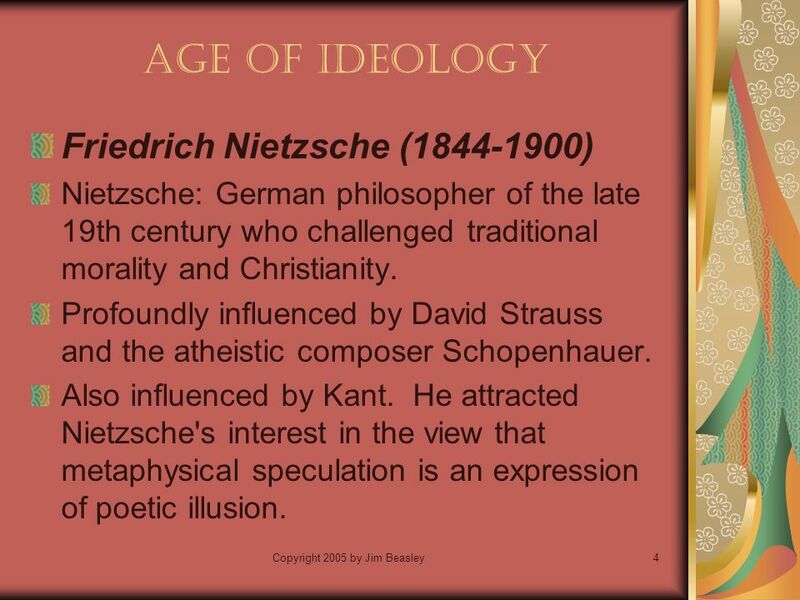 4 Copyright 2005 by Jim Beasley4 Age of Ideology Friedrich Nietzsche (1844-1900) Nietzsche: German philosopher of the late 19th century who challenged traditional morality and Christianity. Profoundly influenced by David Strauss and the atheistic composer Schopenhauer. Also influenced by Kant. He attracted Nietzsche's interest in the view that metaphysical speculation is an expression of poetic illusion. 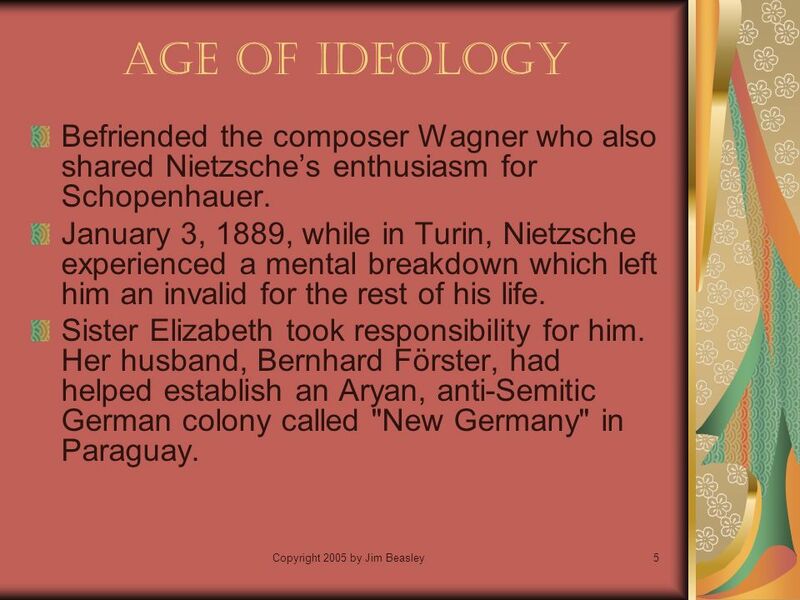 5 Copyright 2005 by Jim Beasley5 Age of Ideology Befriended the composer Wagner who also shared Nietzsches enthusiasm for Schopenhauer. January 3, 1889, while in Turin, Nietzsche experienced a mental breakdown which left him an invalid for the rest of his life. Sister Elizabeth took responsibility for him. Her husband, Bernhard Förster, had helped establish an Aryan, anti-Semitic German colony called "New Germany" in Paraguay. 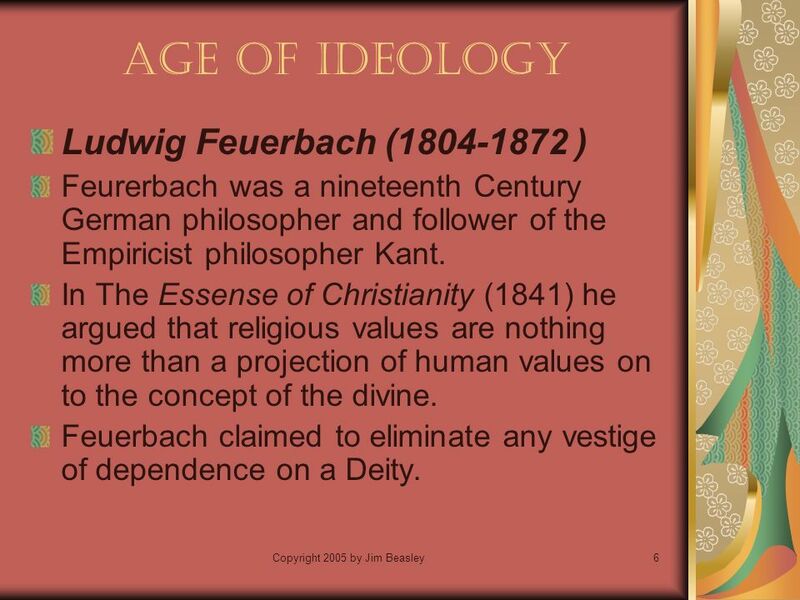 6 Copyright 2005 by Jim Beasley6 Age of Ideology Ludwig Feuerbach (1804-1872 ) Feurerbach was a nineteenth Century German philosopher and follower of the Empiricist philosopher Kant. In The Essense of Christianity (1841) he argued that religious values are nothing more than a projection of human values on to the concept of the divine. Feuerbach claimed to eliminate any vestige of dependence on a Deity. 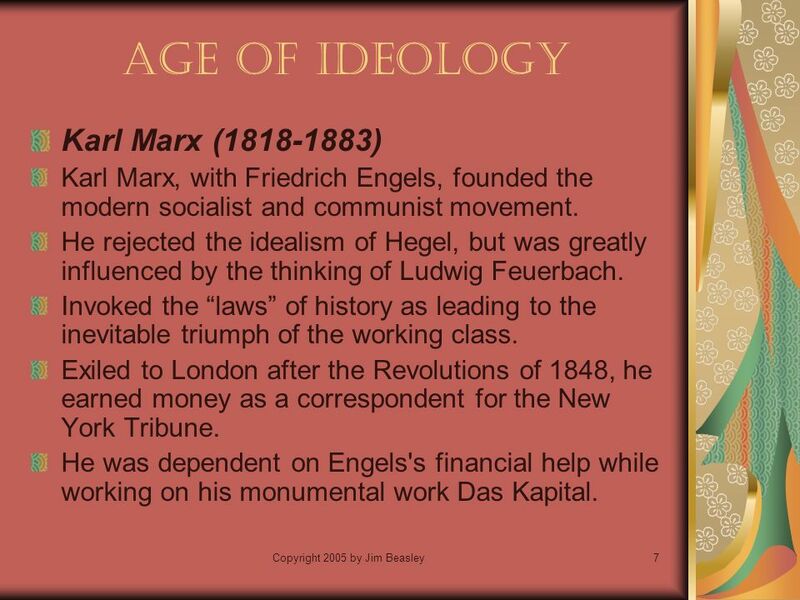 7 Copyright 2005 by Jim Beasley7 Age of Ideology Karl Marx (1818-1883) Karl Marx, with Friedrich Engels, founded the modern socialist and communist movement. He rejected the idealism of Hegel, but was greatly influenced by the thinking of Ludwig Feuerbach. Invoked the laws of history as leading to the inevitable triumph of the working class. Exiled to London after the Revolutions of 1848, he earned money as a correspondent for the New York Tribune. He was dependent on Engels's financial help while working on his monumental work Das Kapital. 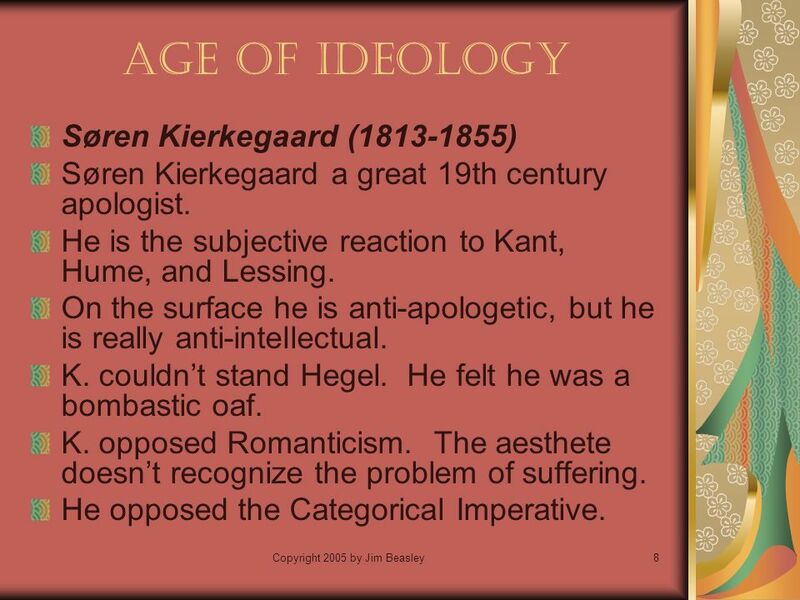 8 Copyright 2005 by Jim Beasley8 Age of Ideology Søren Kierkegaard (1813-1855) Søren Kierkegaard a great 19th century apologist. He is the subjective reaction to Kant, Hume, and Lessing. On the surface he is anti-apologetic, but he is really anti-intellectual. 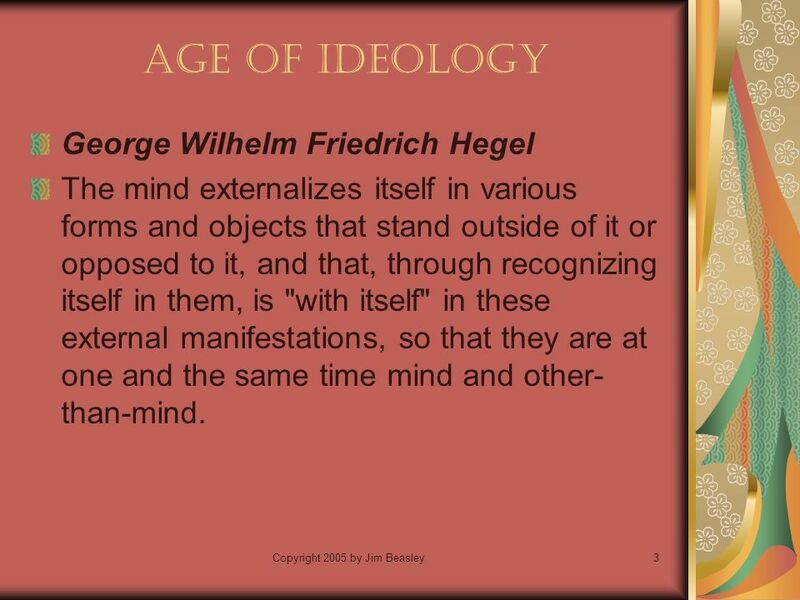 K. couldnt stand Hegel. He felt he was a bombastic oaf. K. opposed Romanticism. The aesthete doesnt recognize the problem of suffering. He opposed the Categorical Imperative. 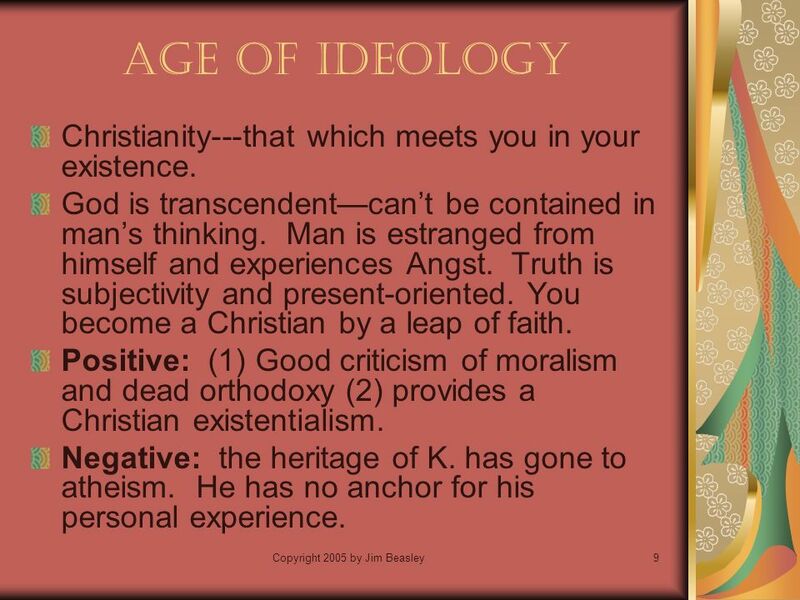 9 Copyright 2005 by Jim Beasley9 Age of Ideology Christianity---that which meets you in your existence. God is transcendentcant be contained in mans thinking. Man is estranged from himself and experiences Angst. Truth is subjectivity and present-oriented. You become a Christian by a leap of faith. Positive: (1) Good criticism of moralism and dead orthodoxy (2) provides a Christian existentialism. Negative: the heritage of K. has gone to atheism. He has no anchor for his personal experience. 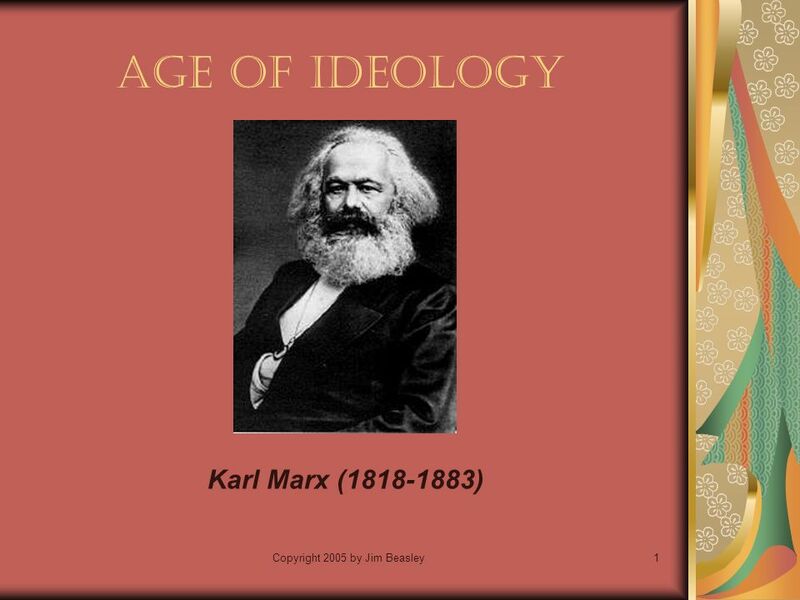 Download ppt "Copyright 2005 by Jim Beasley1 Age of Ideology Karl Marx (1818-1883)"
Karl Marx & Friedrich Engels Sociology 100 The philosophers have only interpreted the world, in various ways; the point, however, is to change it. Psychodynamic Psychology Definition Based on unconscious cognitive, emotional and relational dynamics that influence behavior Drives – instincts that. Chapter 26 Neo-orthodoxy: Karl Barth and others. Questions to be addressed in this chapter 1.How was existentialism a precursor to neo-orthodoxy? 2.Who. What is the meaning of life?. Focuses on the condition of human existence, and an individual's emotions, actions, responsibilities, and thoughts, in creating. Philosophy 1010 Class 7/17/13 Title:Introduction to Philosophy Instructor:Paul Dickey Tonight: Finish. L11 - L12: Revolutionary Changes in Economic Life: Marxism Agenda Objective: 1.To understand the theory, principles, and ideas of Marxism as laid out by. Karl Marx - Overview Fall 2010 Marx -- Biographical I Born Trier 1818. Newton and psychology Thanks to Newton, scientists and philosophers know that the world is controlled by absolute natural laws, so the inconsistencies. Age of Anxiety Europe after 1894 Europeans continued to believe they lived in an area of material and human progress. However, for many this. A man who does not think for himself does not think at all. --Oscar Wilde. I may disapprove of what you say, but I will die for your right to say it. --Francois-Marie. Lawrence M. Hinman, Ph.D. Director, The Values Institute University of San Diego 6/9/2015(c) Lawrence M. Hinman1 Divine Command Theories of Ethics. History of Philosophy. What is philosophy?  Philosophy is what everyone does when they’re not busy dealing with their everyday business and get a change. Friedrich Nietzsche By: Ethan Zakrewski, Derek Moore, Jordan St. Peter, Sarah Donaldson, and Madison Queen.